Foot arthritis pain, in general terms, is inflammation and swelling of the cartilage and lining of the joints, generally accompanied by an increase in the fluid in the joints. Foot arthritis pain has multiple causes; just as a sore throat may have its origin in a variety of diseases, so joint inflammation and arthritis are associated with many different illnesses. Arthritis is a frequent component of complex diseases that may involve more than 100 identifiable disorders. If the feet seem more susceptible to foot arthritis pain than other parts of the body, it is because each foot has 33 joints that can be afflicted, and there is no way to avoid the pain of the tremendous weight-bearing load on the feet. Foot arthritis pain is a disabling and occasionally crippling disease; it afflicts almost 40 million Americans. In some forms, it appears to have hereditary tendencies. While the prevalence of arthritis increases with age, all people from infancy to middle age are potential victims. People over 50 are the primary targets. Foot arthritis pain can result in loss of mobility and independence, but that may be avoided with early diagnosis and proper medical care. Skin changes, including rashes and growths some forms of arthritis osteoarthritis is the most common form of arthritis. It is frequently called degenerative joint disease or wear and tear arthritis. Although it can be brought on suddenly by an injury, its onset is generally gradual; aging brings on a breakdown in cartilage, and pain gets progressively more severe, although it can be relieved with rest. Dull, throbbing nighttime pain is characteristic, and it may be accompanied by muscle weakness or deterioration. Walking may become erratic. Rheumatoid arthritis (RA) is a major crippling disorder and perhaps the most serious form of arthritis. 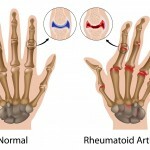 It is a complex, chronic inflammatory system of diseases, often affecting more than a dozen smaller joints during the course of the disease, frequently in a symmetrical patternboth ankles, or the index fingers of both hands, for example. It is often accompanied by signs and symptomslengthy morning stiffness, fatigue, and weight lossand it may affect various systems of the body, such as the eyes, lungs, heart, and nervous system. Women are three or four times more likely than men to suffer RA. 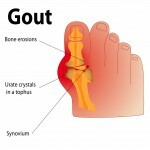 Gout (gouty arthritis) is a condition caused by a buildup of the salts of uric acida normal byproduct of the dietin the joints. A single big toe joint is commonly the affected area, possibly because it is subject to so much pressure in walking; attacks of gouty arthritis are extremely painful, perhaps more so than any other form of arthritis. Men are much more likely to be afflicted than women, an indication that heredity may play a role in the disease. While a rich diet that contains lots of red meat, rich sauces, shellfish, and brandy is popularly associated with gout, there are other protein compounds in foods such as lentils and beans that may play a role. Different forms of arthritis affect the body in different ways; many have distinct systemic affects that are not common to other forms. Early diagnosis is important to effective treatment of any form. Destruction of cartilage is not reversible, and if the inflammation of arthritic disease isn’t treated, both cartilage and bone can be damaged, which makes the joints increasingly difficult to move. Most forms of arthritis cannot be cured but can be controlled or brought into remission; perhaps only five percent of the most serious cases, usually of rheumatoid arthritis, result in such severe crippling that walking aids or wheelchairs are required. The objectives in the treatment of foot arthritis pain are controlling inflammation, preserving joint function (or restoring it if it has been lost), and curing the disease if that is possible. Because the foot is such a frequent target, the doctor of podiatric medicine is often the first physician to encounter some of the complaints inflammation, pain, stiffness, excessive warmth, injuries. Even bunions can be manifestations of arthritis. Foot arthritis pain may be treated in many ways. Patient education is important. Physical therapy and exercise may be indicated, accompanied by medication. In such a complex disease system, it is no wonder that a wide variety of drugs have been used effectively to treat it; likewise, a given treatment may be very effective in one patient and almost no help at all to another. Aspirin is still the first-line drug of choice for most forms of arthritis and the benchmark against which other therapies are measured. The control of foot functions with shoe inserts called orthosis, or with braces or specially prescribed shoes, may be recommended. Surgical intervention is a last resort in arthritis, as it is with most disease conditions; the replacement of damaged joints with artificial joints is a possible surgical procedure.